KIAC – We all take part in the songwriting sessions so one could say it’s a combined effort. KIAC – Not at the moment. MMP – What are your occupations outside of Kitty in a Casket? KIAC – We all pretty much have full-time jobs so coordinating everything band-wise is definitely not an easy job but we always seem to manage it. MMP – Let’s talk about the Austria Psychobilly scene. What are the current bands you like? KIAC – It’s hard to pinpoint specific bands because we all have different tastes, but the Bloodsucking Zombies From Outer Space are an act worth checking out. 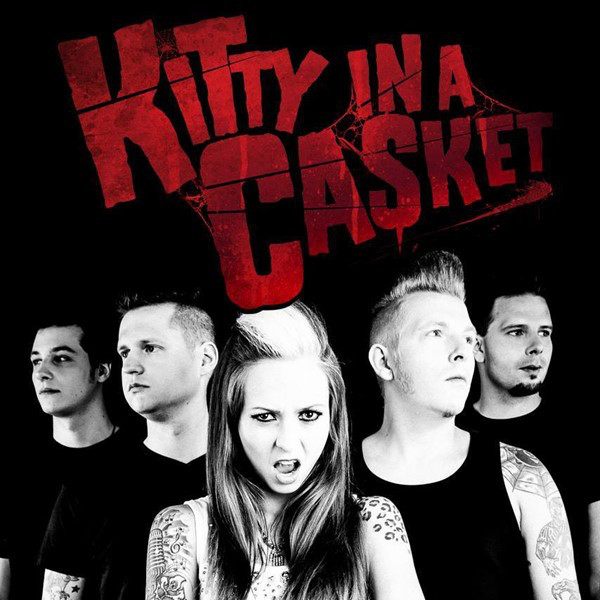 KIAC – It’s punk rock with rockabilly elements and mostly horror-themed lyrics. Raw, Loud and ‘In Your Face’ kind of sound. KIAC – We have many, as mentioned before but here’s a few bands we really like – Rancid, Rise Against, AFI, Tiger Army, The Bones and the Misfits. KIAC – Splatter movies definitely play a part and so do the usual vampire and zombie books and stories. Pretty much anything can be used as a source of inspiration. KIAC – We’ve toured extensively through Europe and the States playing major festivals and club shows. We recently came back from a US & UK tour promoting our latest album ‘Kiss & Hell’. MMP – Describe the diversity of fans that attend your live shows? KIAC – Punk rockers, Rockabillys and Bellas, Metalheads, Old-school rockers, Bikers, Psychobillys, alternative folk… the diversity is all there. KIAC – We’ve already started writing new stuff and we hope we can bring out new material soon. MMP – What are the future tour plans for Kitty in a Casket? KIAC – For now, another European tour this year. It’s too early to speak about the rest. KIAC – Rock on guys and girls and come out to one of our shows if you can. We’re looking forward to meeting you out there!